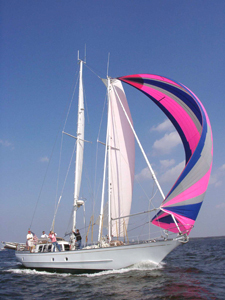 Schooner Heron is generally high up in the standings, and won First Place in her class in 2001 and 2008. In 2001, she was overall winner, having the best corrected time of all vessels. for paying crew aboard the years we do the Race. You will be aboard Heron from Wednesday afternoon in Canton, Maryland through Saturday afternoon, in Portsmouth, Virginia. Come join us and sail alongside our crew of outstanding sailors. They are friendly, knowledgeable, and fun to be with. If you are experienced, you will join the crew in working the boat... hard! If you’re relatively new to sailing, we’ll teach you to do what you can, and you will move about the boat in comfort to allow us to do what we do. Make no mistake: this is no luxury cruise aboard Heron. Nobody will be handing you softdrinks and catering to your needs. We all work the boat, and help with the sailing, cooking, cleaning, sail keeping and misc. chores involved with being aboard. We push the boat very hard, which is why we generally do very well in the Race. The Parade of Sail Wednesday afternoon, where all boats participating in the Race depart the docks in Canton, MD to sail around Baltimore’s Inner Harbor in very close quarters. This is a spectacular sight, second only to the Thursday starting line for the beginning of the Race. Wednesday night: All Hands Party in Canton at the Baltimore Marine Center, an invitation only party for captains, crews, sponsors, and volunteers. Complimentary dinner; cash bar. Thursday morning. After the 0800 hours Skipper’s meeting, we cast off for the start of the Race, which is a 3-hour sail down the Bay to the starting line just south of the Chesapeake Bay Bridge near Annapolis. 1330 Hours, Thursday: The magnificent and breathtaking start of the Race. All the schooners and tallships jockey for position, and at the gun... we’re off down the Bay. Sometime Friday: We pass over the finish line, which is the line of latitude for Thimble Shoals Light outside Norfolk Harbor. We then ratchet down and motor/sail into the Elizabeth River, past the Naval Shipyards to Portsmouth, Virginia, where the Race boats are docked for the weekend. Tying up... we fall into our bunks. Saturday: Pig and Oyster Roast, and Awards Ceremony. Invitation only, to captains, crews, sponsors, and volunteers. Food and beer included. The race results will be announced and awards presented. At the end of the Awards Ceremony, paying crew will say their farewells and be on their own. You may find lodging at one of two hotels in the immediate locale, and arrange for your own transportation home. There are many more details. Please write for information. info@schoonerheron.com Seats will go on a first come/first serve basis, when reservations are paid in full. And please go to the Great Chesapeake Bay Schooner Race website to learn more about the Race.